The history of the United States is the history of its elected presidents, without whom the country would still be a mash-mash of several territories, native tribes and colonialpossessions. America’s war against colonialism would act as a catalyst of nationalism for several countries in the decades to come after the official surrender of the British at their defeat at Yorktown in 1783. The War of American Independence was led none other than by George Washington, the first President and one of the most influential rulers in American history. 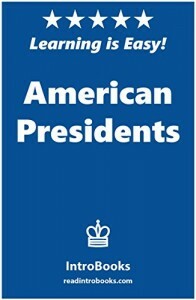 The country’s gradual rise and triumph as the leading international power in the 20th century, still observed today, is a legacy left by none other by leading presidents like Abraham Lincoln, Theodore Roosevelt, Thomas Jefferson, Benjamin Harrison and Franklin Roosevelt among many others, followed by their staff and individuals who coordinated in making a country known today as United States of America. Brief discussion on the foundation of American constitution following from the events relating to the great war of independence, the legacy left behind by George Washington and his first cabinet, all up to the declaration of the Civil War, the bloodiest indigenous conflict the U.S has ever faced, resolved ingeniously by Abraham Lincoln’s rigorous presidency and his guiding leadership still felt across America, are some of the topics of this volume. The legendary guidance showed by Franklin Roosevelt during the Second World War and the charismatic leadership of the late John F. Kennedy are some of the ending topics, concluding finally with the legacy left by modern presidents such as Bill Clinton and the currently presiding incumbent, Barrack Obama.